There was my visit to the Oakville Handweavers & Spinners Guild meeting last Friday afternoon. Their blog is here. It was a Very Cool Experience! First off, after emailing back & forth, it was great to finally meet the president, Ixchel. Not only is her work as a weaver amazing but she is also really passionate about the Guild. The members were also all so welcoming! I never felt out-of-place & don’t you know that another lady has generously invited me over to try out her own wheels?! Sitting in the meeting truly felt like someone had flipped a switch. Here I’ve been fumbling along, and all of a sudden I am finding out about 4 local events, looking at fiber magazines, and listening to a presentation about design trends. It was such a pleasure that I had to join! If you haven’t been following this, basically, while we were in Jamaica my Mom’s 1 year-old puppy took a shine to my wool. He’s a bit mouthy that Ribbons (to wit, the picture above). He mauled some vitality into the pink pastel merino before I caught him in the act. I gave him some assertive (not so calm) dog whispering & we came to an understanding about my wool. To honour his contribution, I spun his stray fur in with the wool. It’s called The Itality Skein in my Rav stash. As in Ital – for more on that see: this Wiki. This was my very first Spindling challenge, & I’m happy for all the love-clicks. Still on spinning… I have ordered a copy of Amelia Garripoli’s Productive Spindling thanks to the excellent review in Spin-Off’s winter ’09 issue! A bit leggy but blooming! Man, is that a sight for sore eyes! 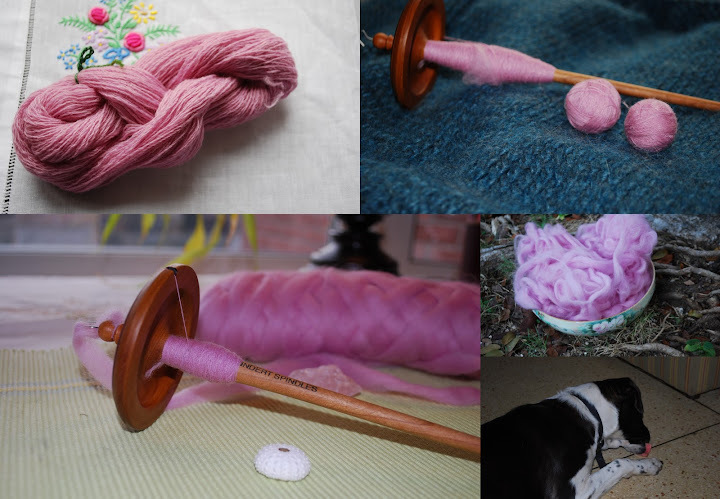 Categories: Spinning, Spinning Guild, Stash in; Stash out, Things Jamaican | Tags: Flora, Merino wool, Ravelry, Spinning | Permalink.